You Need These Mamma Z's Tortilla Factory Tortillas In Your Life. You haven't tasted corn tortillas until you've sampled the extraordinary, organic version created by Mamma Z's Tortilla Factory in Bentonville. These tortillas aren't created from cornmeal from a sack. They're made from masa ground on-site from organic whole corn, and they are the tortilla you need for your next taco. It's rare that any food item makes me truly verklempt, but that's exactly how I felt after an afternoon in Rogers and Bentonville. I'd been over at Local Lime, taking a gander at Scott McGehee's new place. He introduced me to Luis Zepeda, who was dropping by to see how the tortillas the restaurant planned to use were working out. Zepeda and McGehee chatted a bit over the salt content a bit. Both men mentioned I really needed to drop by Mamma Z's. So I did. Mamma Z's Tortilla Factory opened in January next to Maria's Mexican Restaurant in Bentonville. It's headed by Rosalba Zepeda and ran by a few employees, including Luis, her husband. The tortilleria has yet to announce an official grand opening, but business has been quick to pick up, with clients including Modern Biscuit, Yeyo, and the Purple Banana food truck that operates around Fayetteville. It's also providing all the tortillas for Local Lime Rogers - and, soon, the Little Rock location as well. Now, off the bat I need to clear something up. I've been avoiding all corn for a few months on doctors' suggestion. I've had issues on and off with some corn products, particularly commercially prodiced tortilla chips and sodas sweetened with high fructose corn syrup. These things have caused me swelling and rashing, and to find out what the problem is I've started from ground zero. I'll get back to this point in a moment. Rosalba and Luis welcomed me in and immediately gave me the grand tour, kernel to completion. They took me to the back of the building, where stacks of bags of corn are kept. Mamma Z's (named for Rosalba, who's a mom to everyone) utilizes whole corn only, specifically four varieties of corn from Rovey Seed Company in Farmersville, Illinois. The corn becomes a tortilla through a series of steps known as the nixtamal process. Nixtamalization is a culinary technique that utilizes an alkaline substrate in order to process and cook corn, usually using limestone or lye. The Zepedas, however, are using hydrogen peroxide. Luis invited me to come up to the top of the custom built machine that begins the process. The hydrogen peroxide solution is heated; the dry whole kernel corn is poured in and continuously paddled through the solution for more than an hour. power washed and then extruded into the chamber to be ground fine for masa. The process removes the skins from the corn and gives it a different texture. Once the corn is ground to masa, it rests for at least 11 hours, which gives it time to proof. Masa, of course, doesn't rise, but the flavor of the cooked corn is given time to mature before the next step. At that point, the masa is mixed with salt - and, depending on what color is desired, additional vegetative matter. White, yellow, blue and red tortillas can be created just from the corn itself. Variations include green tortillas dyed with the addition of kale, red from chiles, and a beautifully fuschia purple from beets. The Zepedas add just enough to produce the color, with little extra flavor added to the chip. And that's it - no GMOs, no preservatives, gluten-free. The mixed masa is then rolled and placed in another specialty machine that's just fantastic to watch. At the top, a presser, roller and cutter work in conjunction to create perfectly shaped tortillas. These rounds are sent along one conveyor belt that takes them through the natural gas powered baking unit five times. Another belt sends them to one last machine, which is just a big conveyor belt that takes the tortillas under fans five more times. By the time they're done they're dry but still warm, and they're packaged by hand. The entire process takes about 21 hours. I can't quite convey how fascinating this all is to me. The day I went in was just a few days before Mexican Independence Day, September 16th. Specialty packages were being assembled with red, white and green tortillas representing the colors of Mexico's flag. Another batch was started while I was there - of purple tortillas specifically for Purple Banana. Mamma Z's does a lot of orders custom made to client specifications, tailored on needs with the addition of color and the regulation of salt percentage. They also fresh-make and fry tortilla chips from purpose-made tortillas - unlike some places where day-old tortillas are recycled into chips, these tortillas come off the line ready to quarter and fry. Which brings me back to something I mentioned earlier. I do a lot of food research, and with the exception of pork (which I am very, VERY allergic to) I will try anything, even knowing I'll deal with a little bloat later. And though it had been a few months since I had sampled even the slightest bit of cornmeal product, I tried a single Mamma Z's tortilla chip when it was offered. A few minutes later, I went back for another. And again. No allergic reaction whatsoever. No bloat, no rash... just a perfect texture and flavor I have craved for so long. As the realization spread over me, I came close to breaking out in tears. I brought some to take home and try and enjoy. In particular, I love the pliant tortillas in soft tacos - and those chips were used for everything for a few days - true nachos individually topped with cheese and different accoutrements, with guacamole, and with Mamma Z's own medium-heat, not-sweet pineapple salsa. Now I'm making a list of what to pick up the next time I'm in Bentonville. 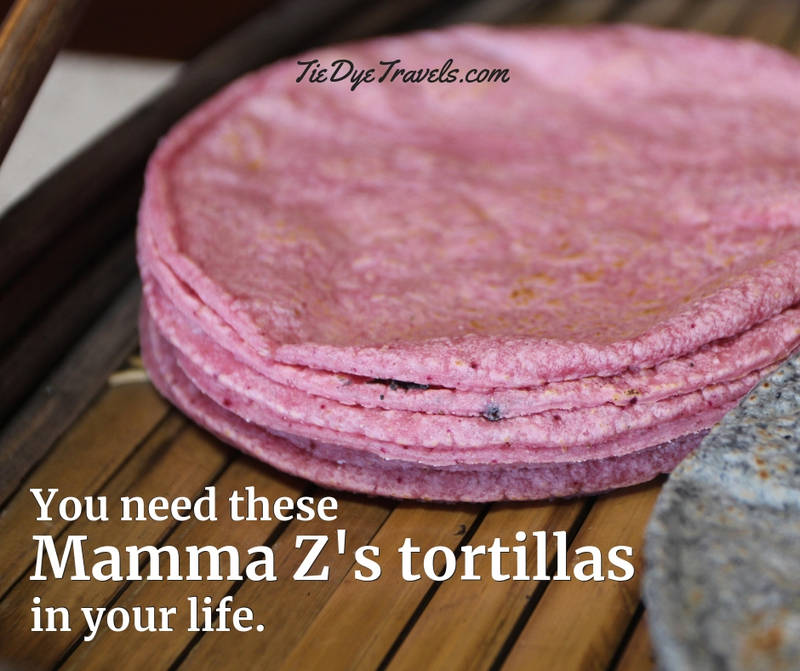 Of course, soon I'll be able to get Mamma Z's tortillas at Local Lime here in Little Rock. Scott McGehee's made arrangements with Sysco to have them shipped down here multiple times each week to supply the store. They're more expensive (about eight cents a tortilla as opposed to less than three cents each) but they'll be worth it. I can vouch for that. If you're up in the Bentonville area, drop in at 2503 South Walton Boulevard and pick up a pack or two. Be sure to check out the Facebook page, or call ahead to (614) 886-4469.